March 27th in Plugin Lists by Wordpress Jedi . Vendi Abandoned Plugin Check: checks with the WordPress.org servers to determine the number of days since the last update. It runs in the background and lets you know when you have an old plugin. Vulnerable Plugin Checker: this plugin checks your scripts for security risks against WPScan’s API. It caches API results to manage load. Plugin Security Scanner: another tool that uses WPScan database to find security vulnerabilities on your server. It runs the scan on a daily basis and alerts the admin if anything suspicious is found. 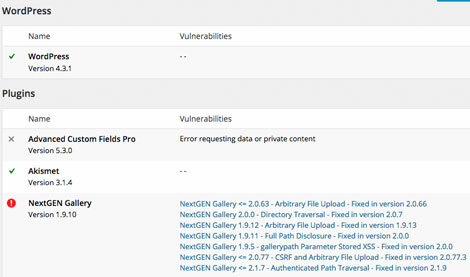 Vulnerability Alerts: scans the WordPress core, themes, and plugins. Shows you the number of vulnerabilities found on the admin toolbar. Stay tuned as we will cover even more useful WordPress security plugins here in the future.